And so we begin the second half of our Countdown. We are now among the Top 50 “Film Favorites.” GET PUMPED. This entry might lose me any claim to critical credibility, but I imagine after the inclusion of Beanstalk, any amount of that I may once have had is negligible by now, anyway. 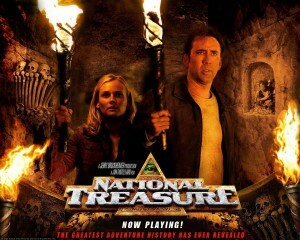 National Treasure, produced by Jerry Bruckheimer (who had launched the Pirates of the Caribbean franchise a year earlier) stars Nicolas Cage as Benjamin Franklin Gates, the youngest descendant of a family of notorious treasure-hunters and conspiracy theorists. For some 170 years, generations of Gateses have been puzzling over an enigmatic clue left to patriarch Thomas Gates by Charles Carroll, the last surviving signer of the Declaration of Independence. 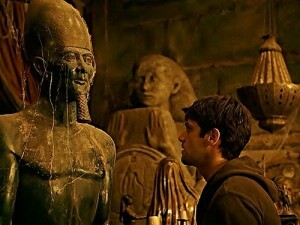 The Gateses believe Carroll’s enigmatic message is connected to a legendary treasure amassed over centuries by various cultures, before being discovered and protected by the Knights Templar, and later the Freemasons. This treasure supposedly made its way to America sometime prior to the Revolution, and only the highest-ranking American Masons, including George Washington and Benjamin Franklin, knew the location of its new home. “Ben” Gates has been searching for the Templar Treasure his whole life, training to become an expert in American history as well as fields like archaeology and underwater salvaging. The film proper opens with Ben, his investor and expedition partner, Ian, and their “computer guy,” Riley Poole (Justin Bartha) trekking across icy tundra in arctic exploration vehicles. They discover the wreckage of a colonial-era ship frozen in the ice, and Ben deduces that the ship is the intended solution to Charles Carroll’s riddle. 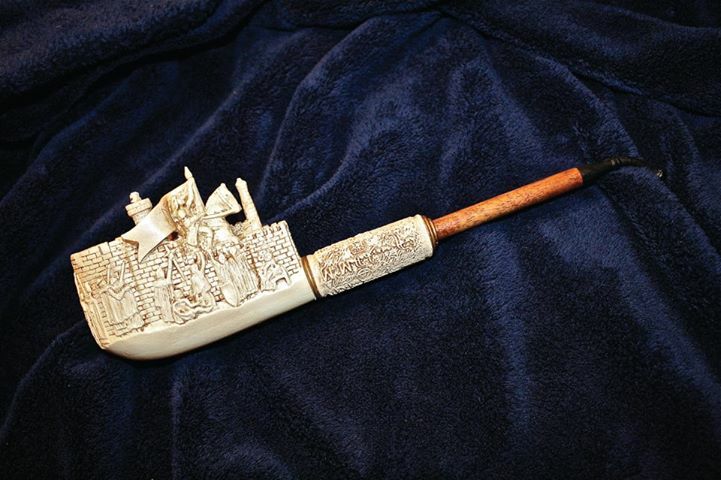 Entering the hull, Ben discovers a Meerschaum pipe (German for sea-foam, referring to the color and light weight of the mineral used in their design) upon which is engraved yet another riddle. 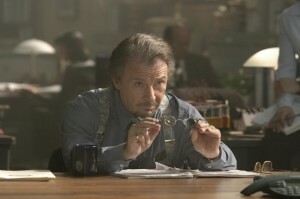 This new clue includes the phrase “55 in iron penned / [what] Mr. Matlack can’t offend.” Ben suggests that the poem indicates the 55 signers of the Declaration of Independence (many of whom were Freemasons) conspired to encrypt a secret map on the back of the document (where Timothy Matlack, the expert penman hired to write the iconic text on the FRONT of the Declaration, couldn’t interfere with it). In order to gain access to the map, one would need access to the Declaration of Independence…which Ian promptly decides to steal. Ian abandons Ben and Riley to explode in the carcass of the frozen ship (it’s filled with gunpowder, as any setpiece worth its salt ought to be). The two escape, and Ben has a new mission: Steal the Declaration first and use it to locate the Templar Treasure before it falls into Ian’s nefarious (and British) hands. Finally convinced that there’s something to the Gates legend, Dr. Chase agrees to accompany Ben and Riley on the rest of their adventure. As predicted, one clue leads to the next leads to the next, and the trio’s quest takes them to historic landmarks including the Franklin Institute, Independence Hall, and finally Trinity Church in Manhattan, underneath which they find a network of subterranean tunnels. 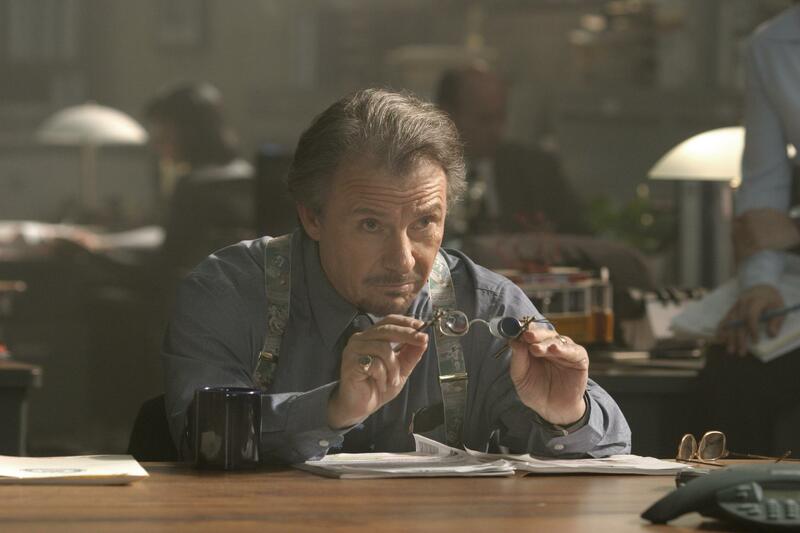 All the while, the three treasure-hunters are pursued by both Ian and the FBI (led by Agent Sadusky, played by Harvey Keitel). Finally Ian corners Ben and company in the tunnel system and demands to be led to the treasure. The group comes across a chamber containing a single lantern hanging from the ceiling, and Ben and his father convince Ian that it is yet another clue, pointing them to the Old North Church in Boston, the site of Paul Revere’s “one if by land and two if by sea” beacon. Ian abandons Ben once more and heads for Boston. Then Ben removes the Meerschaum pipe from his pocket and inserts it into a hole in the wall. Turning it by the stem, Ben unlocks a hidden door, which opens into a colossal treasure trove filled with millennia of the world’s riches. Score one for the conspiracy theorists! The victorious treasure-hunters are apprehended by Agent Sadusky, who reveals himself to be a high-ranking member of the Freemasons. Ben strikes a bargain: He will return the Declaration and provide information leading to Ian’s capture in exchange for the charges against Ben and his friends being dropped. The final scene shows Ben and Abigail living together in a vast mansion once owned by Charles Carroll. Riley berates them for accepting “a measly 1%” of the treasure’s worth as a finder’s fee, when the government offered them 10%. As the treasure’s estimated value is greater than 10 billion dollars, however, 1% is still a considerable chunk of change. Riley gripes and groans about the half-a-percent he received, as he climbs into his brand-new Ferrari and drives away. There’s a lot I like about this movie. Featuring a globe-trotting hunt for lost treasure and historical secrets makes the film feel like a modern-day Indiana Jones movie (and far superior to the actual fourth installment of that series which would be released four years later). The chemistry between the three treasure-hunter characters is strong, and they fire off plenty of witty and humorous dialogue exchanges. It’s true that Ben, Abigail, and Riley neatly fit the “hero protagonist,” “headstrong love interest,” and “comic-relief sidekick” archetypes, but their interactions are funny and engaging, and the epic scope of their adventure makes the film rarely feel cliched, and never boring. 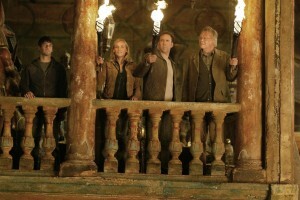 Plenty of people have criticized the film for haphazardly combining multiple secret societies and conspiracy theories, and the implausibility of its plot (it holds only a %44 rating on Rotten Tomatoes). But come on! It’s essentially a historical fantasy. By the nature of its premise (secret societies have collaborated for centuries to protect an enormous treasure), there’s a certain amount of implausibility which needs to be expected and suspended. As with many movies on this list, National Treasure appeals to my passion for the secret, mysterious world which allegedly lies concealed in our day-to-day lives. Whether or not this realm of secrets and cover-ups actually exists, believing that it might, that there might be something more to our world than meets the eye, is the very essence of wonder and exploration. And at the very least, the possibility that a small group of people can make discoveries so groundbreaking continues to make for exciting cinema that sparks the imagination. -After its first cracking, the Liberty Bell was repaired by Philadelphia metalworkers John Pass and John Stow. -Daylight Saving Time was first widely instituted in the U.S.A. in 1918, following WWI. -Charles Carroll of Maryland was the last surviving signer of the Declaration of Independence, and died in 1832 at the age of 95. -The film also highlights the basics of many aspects of cryptography, the study and practice of using coded messages. 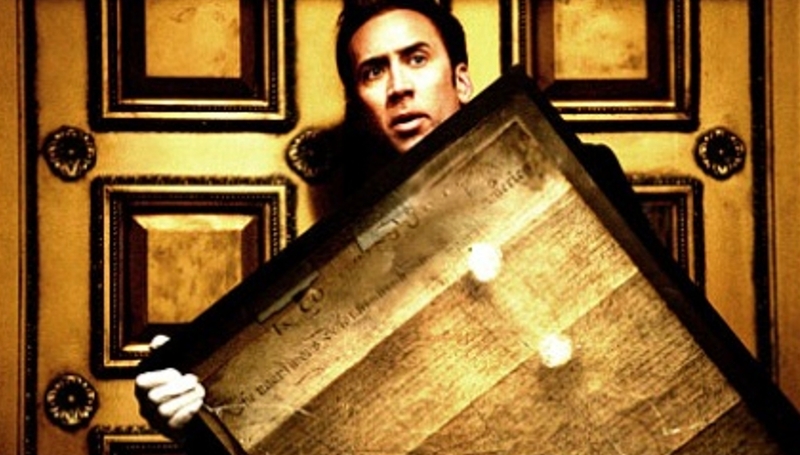 All in all, “National Treasure” is a fun adventure film with the added benefit of encouraging an interest in America’s history. The heist and treasure-hunt elements of the story are well designed and compelling, even if the secret society backstory approaches Dan Brown levels of ludicrous interconnectedness. Everything is foreshadowing. Nothing is coincidence. 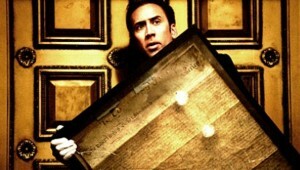 As a final note…I also enjoyed the 2007 sequel, National Treasure: Book of Secrets. While the second half of the film didn’t really fit the first half (the introduction of the “golden city of Cibola” seemed sudden and forced), the setup (a Gates ancestor inadvertently becoming caught up in the planning of the Licoln assassination) was promising. Also, the re-introduction of the main characters at the beginning may be the best opening to a sequel I’ve seen. 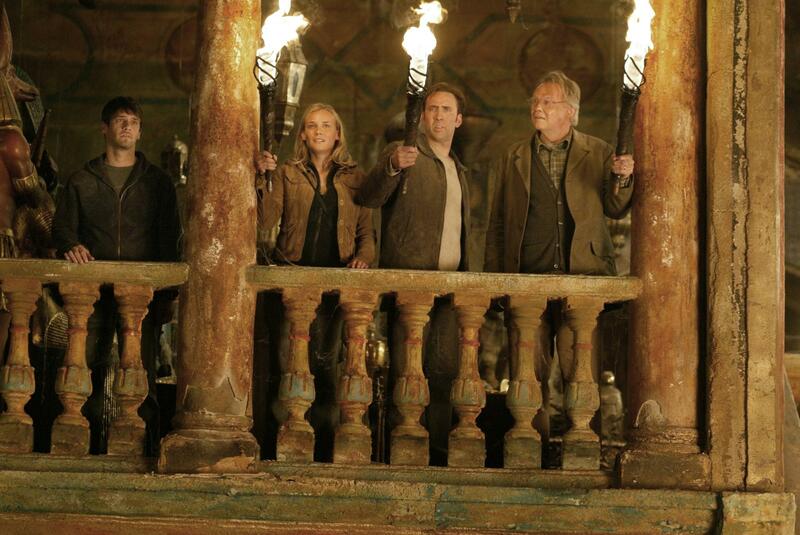 We get to see what has happened to Ben, Abigail, and Riley in the interim after finding the treasure. Riley, who has written a book about the discovery of the Templar Treasure, fails to elicit any interest in his work (particularly from women). The only people who do pay him any mind are those who mistake him for Ben Gates. Riley is overjoyed when someone finally refers to him by name…only to find that his Ferrari has been towed and impounded. In fact, I think I just really like the character of Riley. Justin Bartha is a seriously funny actor, and when he was heinously under-utilized in the Hangover movies I was very disappointed. Get this man in some humorous roles, people!